Four-foot-tall, "wide-eyed" robots with touch screens are now answering common questions and telling stories at six Smithsonian museums, the Smithsonian announced Tuesday. Four-foot-tall, "wide-eyed" robots with touch screens are now dancing, playing games and taking selfies with Smithsonian visitors at six museums, the Smithsonian announced Tuesday. 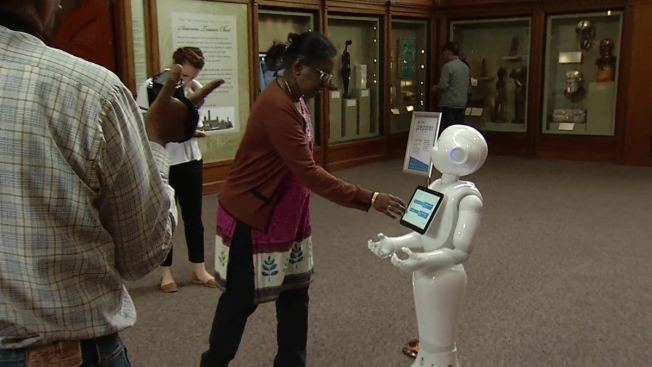 The robots, all named Pepper, will be displayed throughout museums as part of a pilot program aimed at attracting visitors to less popular exhibits and encouraging museum-goers to interact with artwork and artifacts. The robots, which can answer common questions, tell stories and make gestures, can be found at the National Museum of African American History and Culture, the Hirshhorn Museum and Sculpture Garden, the Smithsonian Castle, the National Museum of African Art and the Smithsonian Environmental Research Center. "We're eager to experiment with how Pepper can help us support docents and educators in the vital work they do while providing a fun and surprising experience for the millions of children and adults who visit us each year," Rachel Goslins, director of the Arts and Industry Building, said in a statement. SoftBank Robotics, which manufactures the robots, donated 25 "Peppers" to the Smithsonian museums. However, not all of the donated robots are currently on museum floors. Each robot costs $25,000, a Smithsonian spokeswoman told News4. The robots are programmed to deliver messages based on the exhibit they're near. At the National Museum of African Art, the robots will translate Kiswahilli phrases at the new World on the Horizon exhibit. At the Hirshhorn Museum and Sculpture Garden's ARTLAB+, Pepper will teach coding and software engineering. The robots will also be used to draw visitors toward the National Museum of African American History and Culture's Rosa Parks virtual reality exhibit. As the pilot program progresses, the robots will deliver new messages and display different applications. A Smithsonian employee will always accompany Pepper on the museum and research center floors. "By interacting with museum visitors and providing insight on different exhibits, Pepper will help guide their educational experience through the Smithsonian that they otherwise might have missed out on," Steve Carlin, chief strategy officer of Softbank Robotics, said in a statement.